Why not give your baby shower guests something practical and adorable? 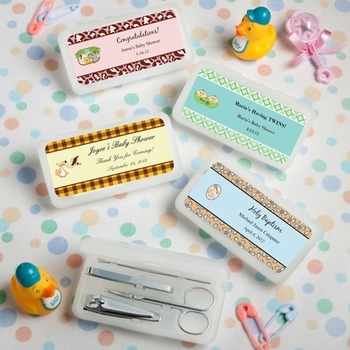 These little travel manicure sets include personalized labels. Using our label designer application, you choose the colors, theme, and wording to make the labels match your event decor. The self stick labels will arrive on a pre-cut sheet and are very easy for you to apply. Note - Assembly required: You apply stickers to kits. Each set measures 3 3/4 by 2 inches with a hinged top and fits easily into a purse or pocket. The set includes four metal utensils including a nail clipper, tweezers, scissors and cuticle tool. Minimum order is 30. Includes free shipping.